This text is a classic by one of America's most widely respected New Testament scholars. It provides a clear and comprehensive introduction to the New Testament. In a straightforward and understandable style--without distortion or oversimplification--Prof. Metzger closely examines the historical background and content of the New Testament and details the role of scribes and translators in handing the Scriptures down through the centuries. 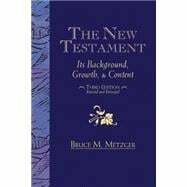 Utilizing the finest modern scholarship, Dr. Metzger looks at the people, societies, and events that produced the New Testament. Palestinian Judaism, Greco-Roman paganism, sources of our knowledge of Jesus Christ, essential aspects of Christ's teaching, sources and chronology of the apostolic age, the work of Paul, the general letters, and the Book of Revelation are all clearly illuminated.The Second edition of this book added an appendix on the formation of the canon of the New Testament and the work of scribes. The third edition will represent a substantial update of the 1965 text based on the New Revised Standard Version. In addition to stylistic changes, the author updates the text regarding research on the Dead Sea Scrolls and the Nag Hammadi tractates. This edition adds a glossary, 30 graphics and photos, and is resized to a larger 6x9 page.